One of the newest models to join the Viking Yachts line-up, the Viking 68C is a four-stateroom blue-water convertible with unmatched performance, bulletproof construction, luxury interior accommodations and advanced propulsion and boat-control technologies. Viking Yachts introduces their all-new 68 Convertible. She is acclaimed best in class and is nothing short of a blue-water machine. Coming from a long pedigree, the 68 is sure to impress at the dock and of course out in the blue-water arena. The Viking 68 Convertible features the attributes of all the larger Viking Yachts yet delivers the handling and efficiency of a smaller vessel. 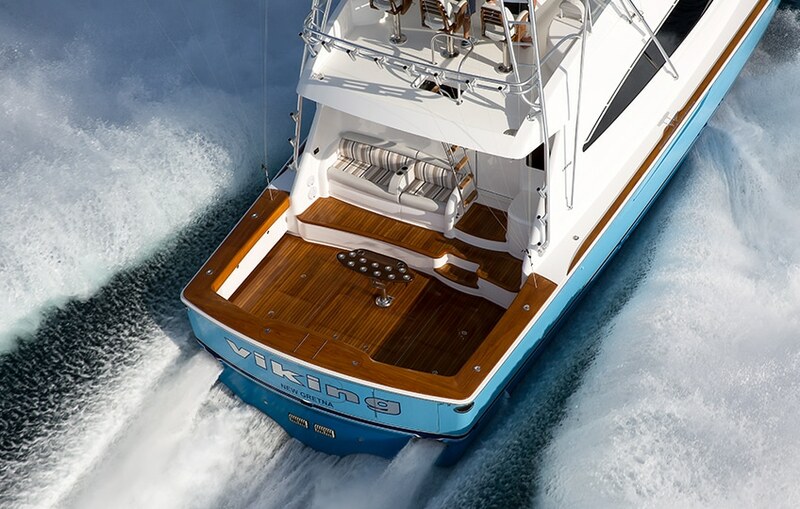 Running on Viking’s proven hull shape with a 12.1-degree transom deadrise, the Viking 68 C delivers a soft ride in rough seas, with a 35-knot cruising speed and a top end approaching 40-plus knots. An aggressively raked stem, gently sloped sheer, swept-back black-masked windshield and flying bridge brow present a powerful yet elegant picture. 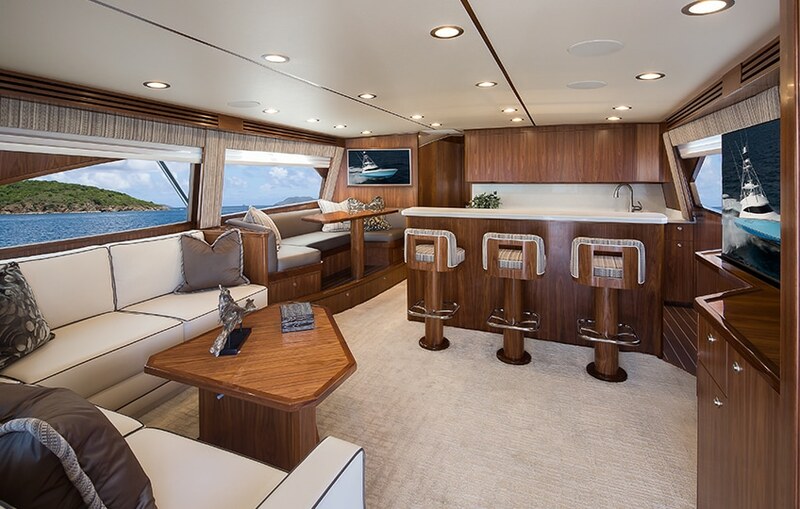 The 176-square foot cockpit provides plenty of maneuverability for the angler while the air-conditioned observation mezzanine keeps guests comfortable when watching the action below. The Viking 68 Convertible is offered with either an open or enclosed bridge. Using the 19 ft. 2 in. beam to its full potential, the salon is the perfect combination of intelligent form and function. The island galley opens to the salon and serves as a prime area for socializing. The dinette seats four along with three stools mounted at the bar. With a layout that puts the companionway to port, the starboard master stateroom is nearly the full beam of the boat. In addition to the master stateroom, there are two guest staterooms and a crew stateroom for a total of four staterooms. The boat is designed for the installation of a Seakeeper gyro stabilizer, which heightens comfort during both fishing and cruising activities. The 68 Convertible comes with twin 1,945-hp MTU Series 2000 V12 diesels for powerful, efficient and clean-running engines. As with all Viking yachts, custom electronic packages and tuna towers can be ordered and professionally installed by Atlantic Marine Electronics and Palm Beach Towers respectively for turn-key delivery and utmost satisfaction and performance. We have the all-new Viking 68 Convertible in-stock and ready to fish, contact us to learn more.